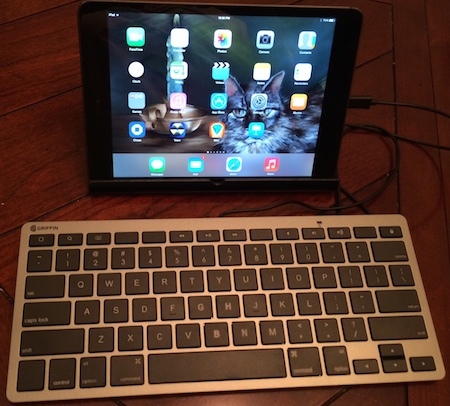 Griffin Technology has released a wired keyboard that specifically works with iPads, iPhones, and iPod touches. Bluetooth enthusiasts will probably raise their eyebrows, but there is method to Griffin’s madness. Indeed, Apple has marketed the iPad and iPad 2 as a transformative educational tool, emphasizing the device's touch-screen display as being intuitive for children to participate in hands-on learning, and last year Apple reported that ten million iPads are in use in schools across the country. Griffin wired keyboard for iOS devices. If you have ever worked in a school testing environment, a government office, or flown on a plane, you know there are times when you can’t use Bluetooth. In testing situations this can become a critical issue as it is possible for Bluetooth keyboards to be paired with more than one device. There is also the issue of batteries going out at inconvenient times. The wired keyboard can eliminate Bluetooth related problems. This keyboard has all iOS key functions. It is available for either 30-pin or lightning cable connections. The cable that is included with the keyboard is 40-in (one meter) long. Full sized keys assist with accurate typing. The keyboard measures 11 x 5-in (28 x 12.7 cm). It is slightly raised on the top to provide a stable typing experience. The MSRP is US$59.99, and the keyboard carries a three year warranty. Never mind classrooms, there are other potential users who simply do not like to deal with Bluetooth. I am among that number, so I was pleased to see that there is finally a wired keyboard that I can use with all my iOS devices. The question is, in spite of the classroom need and the desires of people who prefer wired devices, is this the product to meet those needs? After all, at $60, it is a major purchase and should give good value for the price. The keyboard layout includes a key that instantly allows the user to switch from the wired keyboard to the virtual keyboard available on all iOS devices. There is a function key located next to the control key. The keys are slightly raised. It is easy to type on this keyboard. The keys are slightly raised and they are also full size. I find that I am able to maintain my usual typing speed, which is high, when using this keyboard. Overall, it definitely meets my requirements for a usable keyboard. I do. I despite using the trackpad on my MacBook Pro. I’m not too fond of the virtual keyboards either, particularly on my iPhone. It's a personal preference I know, but that fact makes me dependent on both a mouse and a keyboard, so I judge both with fairly high standards. This keyboard fits the bill for anyone who prefers to use one. The three year warranty is definitely a plus. It has been awhile since I have seen a three year warranty on any electronic device. I wouldn’t recommend purchasing this, or any other keyboard for those who did not grow up in the era of touch typing because they probably will find it to be unnecessary. However, school districts using iPads in the classroom should definitely take a close look. Full size keyboard with raised keys supports touch typing. Keyboard works with all iOS devices with versions available for both lightning and 30-pin connectors. No need for batteries. Security of a wired connection. Product carries a three year warranty. Must purchase separate keyboards for lightning and 30-pin devices. Or buy a 30-pin version and add an Apple adapter.